Savannah Marshall says the gold medal she won at this summer's Commonwealth Games can inspire her to more success at the World Championships in November. The 23-year-old from Hartlepool will be looking to retain her middleweight title in Jeju City, South Korea. Marshall will compete for England at the championships alongside Lisa Whiteside, Chantelle Cameron, Stacey Copeland and Sandy Ryan. 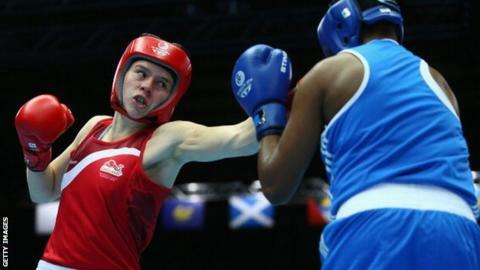 GB Boxing says the team "has a good blend of youth and experience". Marshall said: "In two years since I won the world title I have matured mentally and I feel like a completely different person. Now I just take each bout at a time and enjoy it. "What happened in Glasgow [the Commonwealth Games] really helped to show [the help of GB Boxing performance psychologist Chris Marshall] is working." London 2012 gold medallist Nicola Adams has missed out on selection because of injury. The tournament preliminaries begin on 16 November.